Alexandr Onishenko was Born in 1957 in Chernigov, in the heart of the Ukraine, Alexandr was encouraged in his interest in art from an early age. His talent for drawing was nurtured and despite the repressive totalitarian regime in the Ukraine he thrived. Studying art at school from 1968, followed by the Institute of Art in Kiev until 1979, he had a thorough grounding in the practice and theory of art. His work at the studio in Chernigov gave him invaluable experience in the widest possible spectrum of artistic creation and working with a group of like-minded people allowed his creativity to grow. It is an anomaly of the communist system that artists were at one and the same time repressed and encouraged. While the youthful Alexandr rebelled against the regime it provided him with an excellent education and the environment in which to work, something which many struggling artists from the 'free' world might envy. 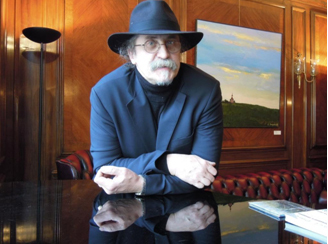 Alexandr became a fixture in the Ukrainian art community and in 1979 a member of the Russian Art Union. He worked on a wide range of projects until in 1981 he moved to Siberia. It is perhaps difficult for those not familiar with life behind the Iron Curtain to understand why he would go to 'the end of the world' to work in the most difficult circumstances, not least of which was the terrible climate. But in a sense Siberia offered a certain type of freedom - the ability to work without the inhibitions of local party apparatchiks breathing down your neck, without the constant need to be judged by one committee or another. To dance to the tune of the party machine. It certainly gave Alexandr a rich vein of experience on which to call, a feeling of being able to survive in any circumstances, of simply, having made it. Whatever, if art is the man and the man is his art then Siberia must be in all his paintings. Alexandr's return to the Ukraine in 1987 was shortly followed by the massive changes that swept across central and Eastern Europe and resulted in the break up of the Soviet Union. But this did not happen overnight as many western news media would have you think. At first Alexandr could only travel to Yugoslavia and Bulgaria. To a western audience these were seen as restrictive regimes - part of the Eastern Block. But, from the perspective of a traveller from a more hard line country they were liberal havens of consumer goods and freethinking. It is all in the mind and reflects your point of departure. Visits to these countries opened Alexandr's eyes to a world of new horizons and in 1990 he committed himself to painting, 'and only painting', to life as a full-time artist. In the same year Alexandr decided to settle in Yugoslavia, the country where he had had his first taste of comparative freedom, but conflict in the region ended this particular dream. Providentially his next choice was Prague and in 1991 he moved to the city and country that have become his home. Prague is, and always has been, a city rich in culture, in established and experimental artistic endeavour. In the early years following the 'velvet revolution' it became a Mecca for those seeking cultural freedom, artistic expression and 'affordable' living. The city buzzed with the excitement of Paris in the 1930's. It was the place to be. Alexandr thrived on it - anything was possible. He quickly moved on from being one of the many artists selling their wares on Charles bridge to being an artist 'in demand' for shows and exhibitions. He was invited to Greece in 1991 to paint, study and find new inspiration from his constantly expanding travels. In 1992 he became a member of the Union of Artists in Prague and began to establish a serious and sought after reputation, painting Prague as it had never been seen before, from the rooftops. Exhibitions in Prague as well as Munich and Wolfsberg in Germany followed in 1993 and Andorra and Basel in Switzerland later in the year. A crucial turning point came in the following year 1994 when after a number of successful exhibitions and with a growing reputation he had the funds to open his own gallery - Galerie Jakubská. He could at last show his pictures as he wanted, have a place for debating, for concerts, a place to share with other artists that he admired and respected. The gallery has gone from strength to strength, it has trebled in size and has provided the perfect showcase for his work. It has won him admirers, friends, patrons and critics from across the world. Alexandr has, at critical stages in his life, found people who wanted to help, to open up new opportunities for him. These are the people who admired his drawings as a child, stopped to stare at his pictures on Charles Bridge or who were enticed into the gallery to admire and praise. These chance meetings gave him his early shows and provided the opportunities to exhibit in London, New York and France. Alexandr's painting can now be found in every corner of the world - not just in Europe and the USA but also in Chile and Mexico, South Africa and Taiwan and more. His paintings have travelled to places that Alexandr can, and does, only dream of. While Siberia, may still be there in many of his pictures you will now find London, New York, Crete, Andorra, the French and German countryside and more. All places that he has visited, exhibited in, that he has loved and that have loved him. Alexandr Onishenko is now a well-established artist in the Czech Republic. In 1998 he received the Masaryk Academy of Sciences award and the Franz Kafka medal. His home is in the countryside near Melnik, north of Prague. He says this area reminds him of his birthplace in the Ukraine. He has converted a church, perched high on a hill, from a decrepit state to a comfortable place to live for his family and a studio in which to paint - safe away from the crowds where he can keep the secret of the black canvas.